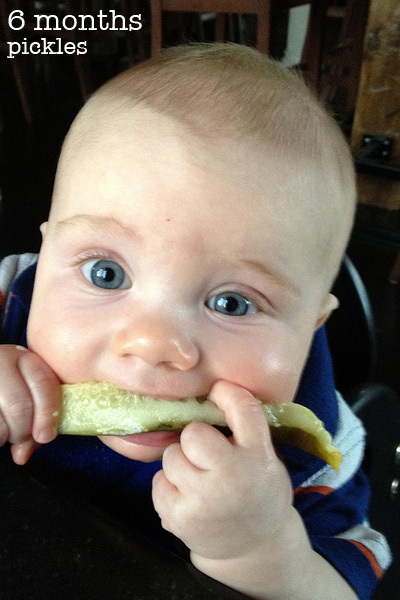 Sam has loved food since he had his first bite of avocado at four months old. 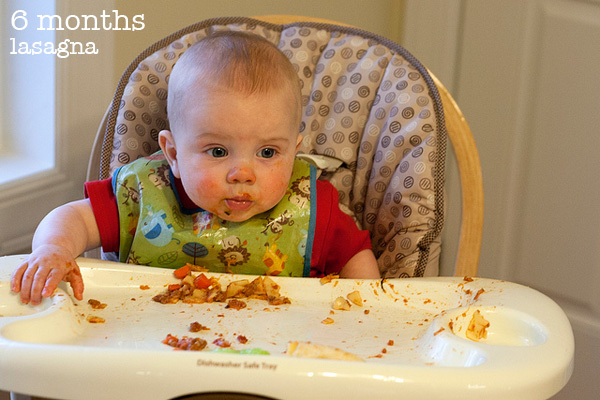 He gobbles up everything we put on his plate — from mangoes and pears to broccoli and beans to lasagna and enchiladas. Okay, except for the time that Nick gave him a cilantro leaf. Though I’m actually surprised that he spit it out considering the amount of grass the kid tries to eat. 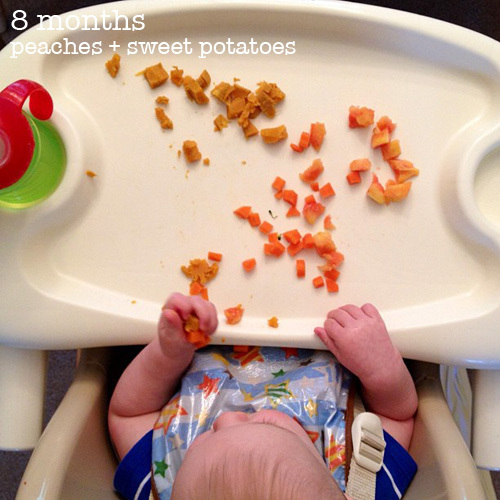 We’ve been following the Baby-Led Weaning approach since Sam turned six months old, and it really works for us. Sam eats what we eat, which makes mealtime easier and more enjoyable for all of us. I’m excited to link up today with A Healthy Slice of Life to share some of our favorite Munchkin Meals! 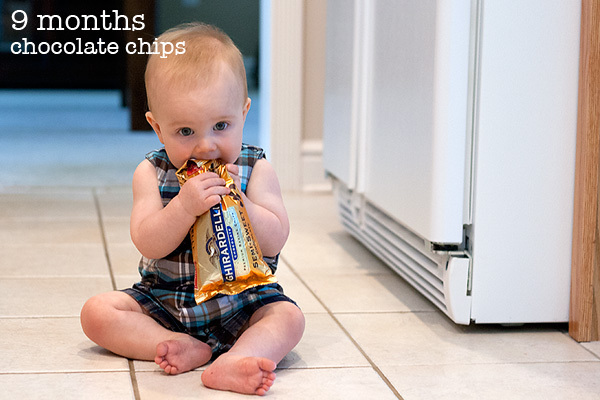 We started Sam on purees at four months, per our doctor’s recommendation. The BLW approach says not to start anything until six months, and then to skip purees completely. I don’t regret doing it our way, though, because our little guy had lots of fun trying new flavors — even if he didn’t keep much of it in his mouth. 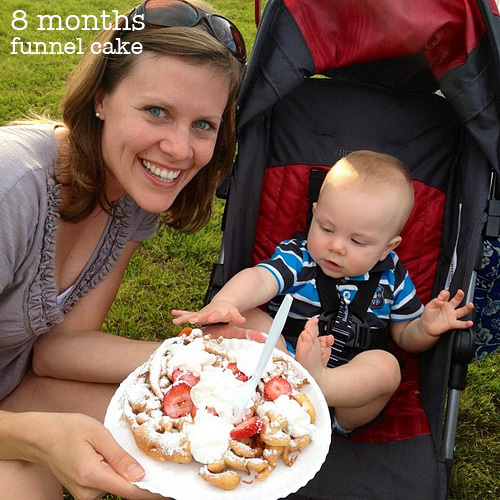 But just before Sam turned six months, we phased out the purees and moved onto solids. We started with slices of avocado, chunks of banana, apples and pears (peeled and sliced into wedges), cucumbers (peeled and sliced into spears), steamed broccoli florets, roasted sweet potato “fries,” and steamed carrot sticks. Basically we offered him pieces of food that he could grab and hold, with enough on one end to stick into his mouth. 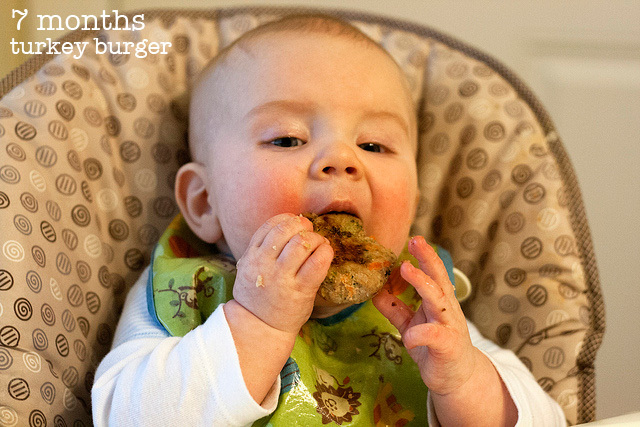 At six months, we also introduced starches like homemade banana muffins, waffles, toasted pita bread, etc. And we always gave him bits of our meals — like noodles from our soup, stewed tomatoes, even chicken tikka masala. However, it didn’t take long for Sam to figure out how to bite off big chunks, which scared me. So I stopped the raw, hard foods and started to steam and roast everything and cut it into small pieces. 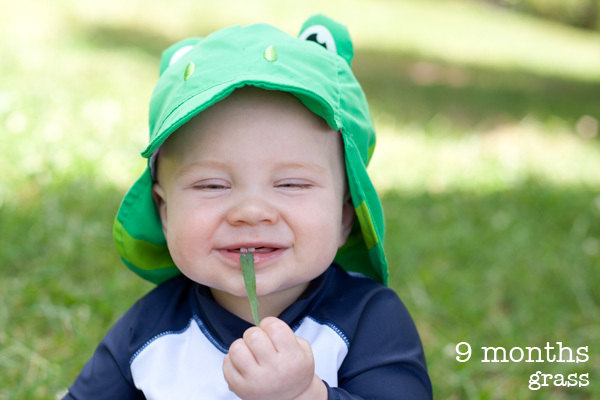 Now that Sam is almost nine months old (seriously, how did that happen? ), I’m proud to say that he is a healthy and adventurous eater. With the exception of a few snacks that I keep on hand for traveling (puffs, yogurt melts, and puree pouches), he eats mini versions of our meals. And sometimes dessert, too. I try to offer him a variety of foods, though he certainly has his favorites. If there is cheese or pasta on his tray, you can bet he’s going for that first. Tortellini, ravioli, macaroni and cheese — he stuffs his mouth and begs for more. He’s also a big fan of sweet fruits and most meats. He gets his own turkey burger when they’re on the menu and loves meatloaf (ours includes ground turkey, sweet Italian sausage, carrots, and zucchini). Also? Pickles. Just like his Daddy. Sam has had eggs, berries, and salmon. Though we do plan to stay away from honey and peanut butter until he turns one. 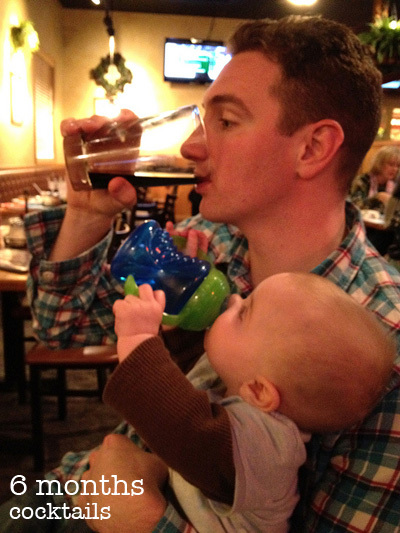 He drinks water from a sippy cup, and we will probably try whole milk soon. I also plan to continue to nurse until he’s at least 12 months old. And while he hasn’t yet had chocolate — except for perhaps a few crumbs of cake and licks of ice cream — I suspect he’ll have a major sweet tooth just like his parents. What does your munchkin eat? I’d love to get some new ideas! Link up with Brittany and share his/her favorites! lol too cute! We didn’t follow anything specifically but around 8 months we started feeding P pretty much everything that we were eating, and we still do unless we eat something spicy or go out without her. Then she gets the staples: mac n cheese, nitrate free turkey dogs, zucchini fritters. I never heard odf a honey allergy until my 50+ brother in law had an allergic reaction to it. We’re planning to try BLW too. I think we might actually wait until around six months, just because we’re not yet seeing a real interest in adult food. Are you doing berries with Sam? One of my mom friends is waiting until a year because she thinks that will help avoid berry allergies, but I can’t find any evidence that that would work. We introduced berries into Sam’s diet at six months — right along with everything else. The only foods we’ve avoided to this point are peanut butter and honey. 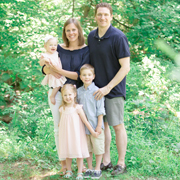 We have no food allergies in our family, and fortunately, Sam has done well with everything! I wish I would have done this approach then maybe I wouldn’t have such a ticky eater now with my oldest!!! Good job momma! Robby will be 13 months on Saturday, and pretty much eats it all at this point. We RARELY give him anything but what we’re having for dinner. His favorite foods are bananas, berries, bread, fish, yogurt, and peanut butter. Obviously, we did BLW, too, and some of that (PB) is new since turning 1. We are waiting until 3 for shellfish b/c I have a shellfish allergy. Great information! Thanks for sharing. Do you season your regular meals with salt, garlic, etc.? I get nervous to give baby these seasonings. Omg this is awesome! Glad I read this pin. This gave me a push to move forward with our 7m babe. He’s done wonderful so far, never refusing anything and has dabbled in chunks but are mostly fed TO him. I’ve done corn, peas, avocado, banana chunks. I’m afraid of too many at once but I guess we have to try and see how much he does or doesn’t shove in! Ty!! You’re great. Is there a post to follow this one? ?